Alfreton Road was originally called Tanners Lane because it led to the Tanyard at the bottom of Golden Valley near Knowtshall. The first building at the top of Alfreton Road is the The Poet and Castle Pub or New Inn as it was originally called. It as had many names over the years and is almost certainly not the first pub on the site. Evidence suggests that there has been a public house at the top of Alfreton Road since 1763 when John Burgin was recorded as holding a victuallers Licence. A few years later in 1798 the first entry appears in the Quarter Session Record of Licensed Victuallers for Thomas Clarke and it was probably around this time that the current public house was erected and named the New Inn. The name was certainly in place by 1802 when an advert in the Derby Mercury newspaper records; An Auction by Mr Gaskill at the house of Thomas Clarke, The New Inn, Codnor. House consisting of parlour and kitchen on the ground floor and commodious bedrooms above. All the above buildings were located within the plot of land currently occupied by the public house now known as the Poet and Castle. I believe this modernisation of the pub took place in about 1862 when it was described in yet another auction as “a newly erected public house”. Fig.2 Above Left: This image extracted from a map dated 1792 shows a group of buildings on the site now occupied by the Poet and Castle. This plot identified “J.S.” was owned at the time by John Stirland. One of these building could have been the public house run by John Burgin. 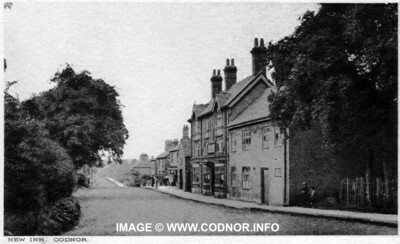 Above middle: The same area dated 1881 now shows the New Inn plus the other various houses and buildings on the plot. Also a line of new shop can be seen along the High Street including Farnsworth Chemists, which was also the village post office. Above Right: this last image from around 1965 shows the pub (then named The Clock) but all the other buildings on the plot have been demolished. The land below the Pub was sold in about 1900 by the owners Alton & Co, Wardwick Brewery for building new housing. At the same time a blacksmiths shop and stables were built adjacent to the pub but these were also demolished when the pub was modernised in 1973. “At the back of the New Inn there was a row of very old, dilapidated stone houses, with thatched and moss-grown roofs. If ever there was a delightfully secluded, peaceful spot, it was here. The gardens were of the real old-fashioned sort, bordered with sweet smelling flowers and herbs, lad’s love, thyme and mint. In the middle spaces, divided by long paths, were vegetable crops, and all hemmed in at the bottom with willow trees and shady high hedges, which separated the garden from the fields beyond. There were no precisely set out sections, but studded about in appealing fashion, trees, flowers and garden stuff grew in pleasing, haphazard profusion”. On the opposite side of Alfreton Road is the car park which was opened around 1971. The trees around the perimeter of the car park were planted by pupils from Whitegates Junior School. The car park was previously a field known as the New Inn Croft, a Saturday market used to be held here up until the 1800’s. It was also used once a year to host Codnor Fair and also a circus. 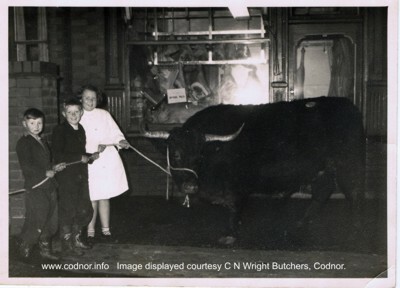 Wright’s butchers also used the croft to hold animals prior to slaughter. Wright’s Butchers was originally founded by Arthur Henry Wright in about 1888, in the butchers shop behind the New Inn. The business existed in this building until about 1900 when the land owners, Alton & Co Wardwick Brewery, sold the land behind the New Inn and all the way down to Parkins Yard. Arthur Wright then moved to the French Horn Inn on Nottinham Road where he is recorded as being the Inn Keeper as well as running his Butchers business down the side of the pub. A few years later in 1909 he built “Roselyn House”, butchers shop and slaughter house, just below the New Inn Croft on Alfreton Road. Arthurs son, also called Arthur Henry Wright eventually took over the business from his father and by 1927 the shop had gas powered refrigeration units and deliveries were made by Horse and cart. After Arthur’s death the business continued with his son Cyril Newman Wright and in 1933 became known as C.N. Wright Butchers. The gas refrigeration was eventually changed to electric in 1948 and the Horse and Cart was upgraded to a Blue Austin 7 van. From left to right; Norman Wright, C Arthur Wright and Maureen Benniston. Cyril’s Son, Cyril Arthur Wright started working in the butchers in 1964 at the age of 16, Cyril still runs the business together with his wife Julie and son Chris. 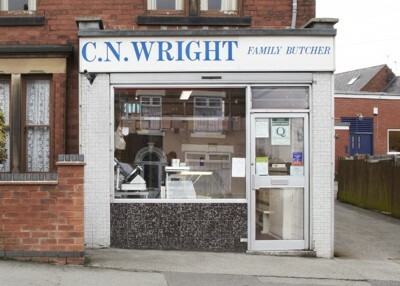 Fig.4 C N Wright Butchers 2011. Displayed courtesy Cyril Arthur Wright. The original shop front was replaced in 1969 with the frontage that can be seen in the above picture, this lasted until the recent modernisation of the shop in 2011. The slaughter house continued to be used up until the last outbreak of Foot & Mouth disease in 2007. C N Wrights butcher’s continues to be a popular family business and has won many awards for its meat products over the years, including nine at the 2012 Smithfield awards, organised by the Q Guild of Butchers. A little further down Alfreton Road on the opposite side to the butchers and just past Hockley yard, stands Home Farm. This farm was built in 1708 using stone taken from Codnor Castle. 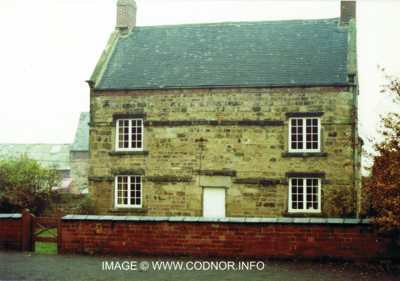 Fred S. Thorpe documents in his book, The Heritage of Codnor and Loscoe, that the farm house was originally part of a complex of buildings called Whyld’s Farm and that the house was purchased by Samuel Woolley (c1661 – 1726) shortly before his death. Fig.5 Home Farm 1983. Samuel Woolley (1785 – 1864) inherited the farm from his father and gave it the name Home Farm. Fig.6 One of the buildings that was part of Home Farm 1983, now demolished. The Woolley’s have been farmers and land owners in Codnor and the surrounding areas for many generations. 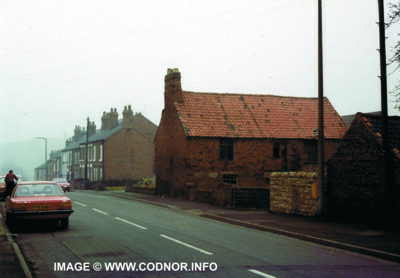 As well as Home Farm on Alfreton Road, members of the Woolley family also owned Hill Top Farm (Ormonde Fields), Hall Farm (now the site of the French horn pub) and other estates at Codnor, Crosshill, Loscoe, Aldercar and Ripley. Members of the Woolley family also subscribed to the building of St, James’s Church, Crosshill and St. Luke’s Church Loscoe. 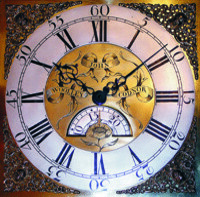 James Woolley 1695 – 1786 and his nephew, John Woolley 1739 – 1796 were well known for their high quality clocks, which were manufactured at Codnor. 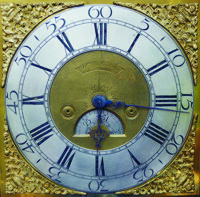 James was thought to be an apprentice of John Wyld clockmaker, who was born in Codnor and later moved to Nottingham. James Woolley was responsible for making the turret clock used in the Exchange building in Nottingham in 1726. In return for this gift he was made a Honourary Burgess of Nottingham. This clock mechanism is now in the Industrial Museum at Wollaton Hall. Just below Home Farm used to stand the Crown Inn, now the site of modern detached houses. The Crown Inn initially started as a beer house in the mid 1800s and was known locally as ‘Deep Benk’ which was mining terminology used to describe a coal face. Colliery workers from High Holborn Pit collected their wages from the Crown Inn. Here is a list of Crown Inn Landlords and approximate dates of occupation. 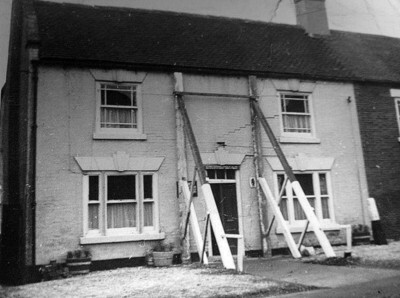 Fig.9 The Crown Inn (Deep Benk) shortly before it was demolished in 1968 due to severe damage caused by mining subsidence. 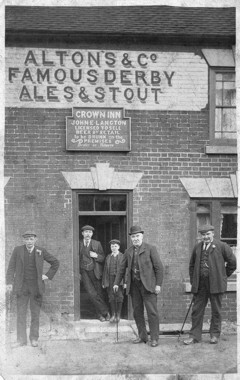 Samual Langton (in bowler hat) his son John Edwin Langton was the landlord at the time. On the opposite side of the road to Home Farm and the Crown Inn is a row of terraced houses. Many older Codnor residents will remember number 33 being Alice Curzon’s general store, now a private house. Fig.11 At the bottom of Alfreton Road stood Holborn Farm until it was demolished in the 1980s. For many years this small holding was owned by the Tissington family. 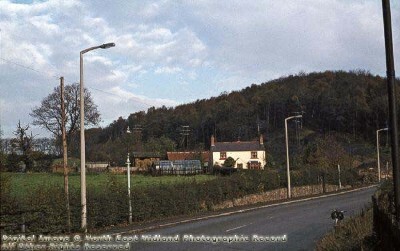 This picture was taken in the 1960s by Len Wood, that’s his bicycle leaning up at the side of the road. Also note the old cast iron street lights that are still in place but are being replaced with the modern concrete items. Past High Holborn woods and on the outside of the next left hand bend once stood two or three very small whitewashed thatched cottages known as the White Houses. Joseph Millott Severn described this area as a very secluded but picturesque location with prolific gardens of Foliage and Flowers. 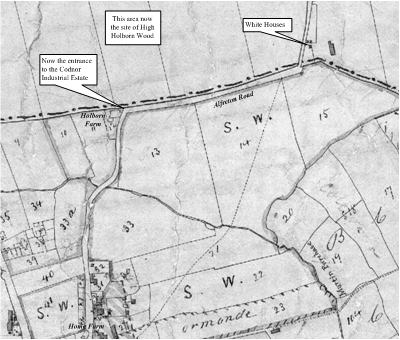 Fig.12 The White Houses are evident on this 1853 map of the area but have disappeared before the 1900 O/S map. This area was mined extensively by the Butterley company in the 19th century, and later opencast in the 1950s. Nothing remains of the White Houses, the only clue left are some remains of the garden Privet hedges amongst the roadside undergrowth. Also a special thank you to Robert Mee of the Heanor History Society for his help with historical research about the New Inn.